Old school dungeon crawling presented in a shiny new package with gorgeous character designs. Can feel repetitive after a while. By their very nature, dungeon crawlers can be a bit of a repetitive grind, but the makers of Demon Gaze have done their best to make sure the experience is bright and enjoyable rather than just feeling like a chore. If exploring dungeons and battling waves of monsters is your thing, and you don’t mind a bit of a steep learning curve at the start, then you’ll get a lot out of this title. When Oz awakens at an inn in the middle of nowhere, he has no idea who he is or how he got there. Taken under the wing of the inn’s owner and its long-term tenants, he learns that he is a Demon Gazer – one with the power to subdue demons and make them do his bidding. Oz is quickly set to work exploring the monster-infested surrounding lands, all with the aim of capturing demons and ultimately challenging the fearsome Grimodar Castle. 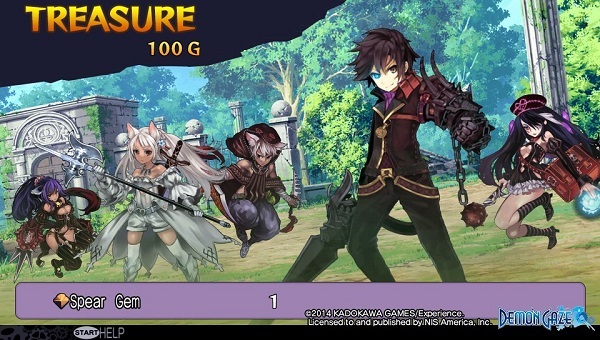 Plenty of classic series and genres have been given a new lease of life on the Vita, and with Demon Gaze it’s the turn of the old school dungeon crawler. Gameplay divides neatly into two parts – backstory and preparation at the inn, and exploration in dungeons, with both halves offering a solid gaming mechanic in a visually appealing package. The Dragon Princess Inn functions as your hub for the duration of the game, and it’s here that you’ll accept quests, recruit party members, buy items, heal up and generally get yourself into fighting form. 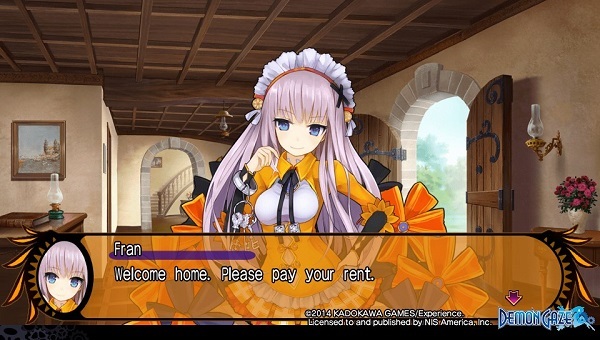 As you’ll soon discover, however, every NPC in the game is out to gouge you – it’s not just that weapons and items are largely overpriced (to make up for this, they’re easy to find in dungeons), but you’ll even have to pay to rent rooms for your playable characters. In fact, every time you leave the inn and come back, you’ll be expected to pay rent to the manager – think of it as the equivalent as popping down to the shops for a pint of milk and finding your landlord on your doorstep demanding another instalment of rent on your return! The inn is also the place where most of the game’s story plays out, with characters coming together for exposition and cut scenes. In this regard, Demon Gaze plays very much to the stereotype of a Japanese game, with more than its fair share of perverted and risqué dialogue, bathing scenes and characters who wander round in their underwear. That being said, however, it would be unfair to say that the game is shallow and out for cheap laughs – there’s a deeper and darker story going on at the same time, and even points in the game where you’ll get so involved in events that you’ll start to really feel for the characters. Once you’re ready to get out in the field, there are dungeons to be conquered. Exploration takes place from a first person perspective, and while there aren’t that many different areas in total, each one is quite extensive, and filled with traps, hidden areas to uncover, and enemy encounters, both set and random. Battles are turn-based, with playable characters falling amongst the usual RPG classes – you can hire such staples as front line fighters, guardian damage sinks, mages and healers. The difficulty level is quite inconsistent early on – you might run into a couple of weakling monsters that your fledgling party can easily deal with, but you’re just as likely to encounter a squadron of powerful enemies who summon reinforcements faster than you can defeat them. 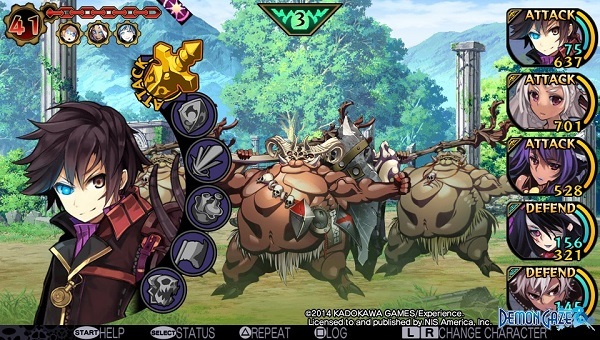 Once you have five party members and a decent range of skills, however, battle becomes very rote and repetitive – something the game designers clearly expected, since at the press of a button you can just issue the same commands as last turn, and then fast forward through each turn. 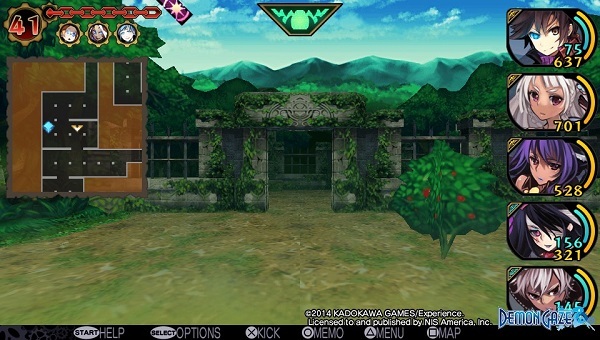 The aim of each dungeon is to capture its resident demon by seeking out special circles scattered about the maps and defeating monsters on each one. Capture all the circles, and then demon itself can summoned; defeat the demon, and it becomes yours to command. Not only do these demons grant special skills to the party for use in the field and in battle, but they can also be summoned to act as an AI-controlled party member. Naturally, this extra help comes at a cost; whenever a demon is summoned, it slowly drains your Demon Gauge – should the gauge empty, the demon will become enraged and start attacking both allies and enemies indiscriminately. Visually, Demon Gaze is a bright and vibrant game overall; the dungeon locations may look a little pedestrian, but this is more than made up for by the effort put into the monster and character designs. Plenty of the character visuals are easy on the eye, and as an added bonus, you can choose from one of 45 designs for any of your playable characters. For story purposes, the hero is a human male, but that doesn’t mean you can’t give him the appearance of a scantily clad catgirl. Similarly, just because you made your character an elf so that they would be good at magic, doesn’t mean that you can’t have them look like a dwarf. Background music is solid if not outstanding, and proves largely catchy at first, if a little repetitive once you’ve been playing for a few hours.